Oh well now this is a pleasant surprise - EXCELSIOR, YOU FATHEAD! 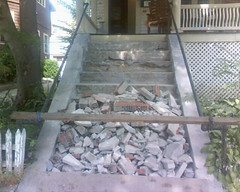 Didja ever wake up in the morning and go outside, only to discover that your front porch steps have been demolished to rubble and you hadn't been aware that such a thing was going to happen? Man, I hate days like that. I have no idea. We had no messages from the landlord and no advance warning of anything. The only thing that keeps me from suspecting vandalism is that they blocked off the bottom of the steps to keep the rubble in place, and also lashed that bar across the railing too. if it had to happen to anyone, at least it happened to someone who can write about it an post a photo. No, but I have woken up to notes from the landlord declaring that our front steps *would* be reduced to rubble, only to find out that they weren't. I'm not sure which scenario I prefer. Yours at least involves some action, while mine involves false hope. Man..when you piss off the house gnomes they don't kid around..
Well, technically, I don't think we noticed until this afternoon. Well, to be fair, my room is at the back of the house and the porch stairs are at the front. I don't hear much down there when I'm upstairs and asleep with the fan on. And I did sleep kinda late today, so, well, hmm. Wonder what the alternative would've been: "Hey, what are you doing to my stairs? Get that jackhammer away from me!" Etc. No, but I did wake up to find the front walk was gone the other day. They were civilized about repaving the steps, though, and did them one side at a time. Seriously. What else were we expected to do with them? I never tire of telling that story, even though folks are still as mystified at the end of it as they were at the beginning. I did come home from school once to find my parents had knocked down our internal staircase. They talked for a while about my sister and I having to use a ladder on the outside of the house to get up there. Turns out, there was a secret staircase hidden in a cupboard by the Victorians which we'd lived with and not known about and they'd fixed that one up instead. It was very exciting to open a door which had previously been a blank bit of wall and find a part of the house we'd never seen before. Uh, so the short answer is, no. But stuff like that happened about four or five times a year because my parents are HILARIOUS like that. I must see this house of yours! That is an awesome house. When I was a kid we almost moved into a 200-year-old house that was rumored to be a stop on the Underground Railroad, and if you swung a bookcase back you'd find a secret, unfinished hidden chamber with dirt floor and exposed brick walls and entirely too little light. It's just as well my parents didn't buy that house. My brothers and I probably would have played The Amontillado Game and shut each other in that room over and over and over again until one of us came down with acute claustrophobia. Since you took this photo from outdoors, did you climb out a window? There was this magical portal in the rear of the house connected to a second, hidden set of stairs which was utilized for this egress in question. Or I just climbed out of a window and shinnied down the tree. Whichever sounds more exciting. NOW will you use that BMX bike we got you for Christmas?? So, hm. That's interesting. Keep us posted.